5:30 AM Alarm goes off again. We are then alert enough to remember why the alarm is going off this early. We both jump out of bed and DH runs through the bathroom to wash up and dress while I put coffee on. Then I wash up, dress, and fix go-cups while DH gets the car out. 5:55 AM We are off on a road trip to Wibaux MT to get a basket and two cases of pomegranates. DH thinks it might be funny to bring up my moment of temporary insanity that happened Monday when I decided to do this. I glance out of the corner of my eye but he can’t see that, since it’s still very dark out and all, but with my lack of reply, he decides maybe it’s not as funny as he thought it was and doesn’t pursue it. Smart man. 6:55 AM we arrive in Wibaux MT to get our basket, two cases of pomegranates, and a basket and apples for another ND VSC. I wonder why she didn’t take advantage of the great pomegranate deal! 7:05 AM we leave Wibaux with the goods and head back to Belfield ND. 7:45 AM we arrive back in Belfield. I question DH as to why it took longer to get there than it took to get back. Okay, I get it. I didn’t see any deer, but admit that I might have been partially snoozing for some of the trip. 8:00 AM we meet up with our neighboring VSC and transfer her goods. Then we decide to eat omelets in town before going home. At this point I’m thinking that a good breakfast would be a wonderful prerequisite to the nap I was planning when we got home. I’m looking very much the bum in my red crocks the cat has chewed up and a raggy sweatshirt with holes in the arms from pruning rose bushes. Whatever! I’m going to go eat! 9:15 AM we arrive home after a wonderful breakfast and unload the goods. I vinegar wash and stash the basket items and decide to start the pomegranates and finish them later after my nap. 9:45 AM DH resurfaces from wherever he disappeared to, and decides to continue to help with the great pomegranate caper. So I get him a container of water, two chairs and sit him down in one chair with the container of water in the other to teach him how to do this. I score him many pomegranates to get him started. I sit back down in my identical post to continue doing the same. I’m secretly making bets with myself as to how long he will last, and when he quits I’ll get my nap. Sometime in here we muse about how if we were an Indian village and had 80+ pomegranates to seed, they would just gather all the women and each do a few and be done in record time and be off to make war paint with them. I marvel that so far there have been no war cries uttered in THIS teepee. 12:25 PM we finish the first box and start on the second box. 1:45 PM I am ready to call it good enough and find people willing to eat the rest, but DH won’t let me. He insists that we finish what we started, and I remember us telling our kids that when they were growing up. I know better than to submit a rebuttal, so I continue seeding poms. I’m starting to realize why the person I picked up for this morning ordered apples instead of pomegranates. We also take a short break to watch two whitetail does and their babies come into the yard and eat the ornamental crab apples off the tree and forage through what’s left of the garden. 3:30 PM I decide to go get the juicer out and start washing and getting the crud out of the pomegranate seed water in preparation of juicing. 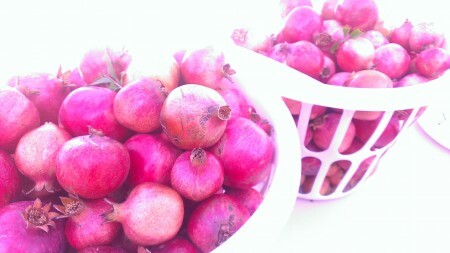 I’m nice enough to score the rest of the pomegranates for DH to finish seeding. He said thank you!!! Hmmm….he’s being amazingly cooperative. 5:15 PM…we’re done with all the pomegranates!!! JOY!…but still have the mess. We ended up with 14 cups of juice that is in the process of being frozen into ice cubes to plunk into morning smoothies, and 8 cups of pom seeds that I’m not sure what I am going to do with. Salads, freeze? Whatever, for now they are in the fridge in a gallon baggie. Tomorrow we deal with them. We both grab a beer and sit and relax. 6:00 PM I start making the stir fry that I was gonna make last night before DH offered to take me out for supper. I was also going to make tomato parmesan, but that is starting to sound more like brunch tomorrow. Wow! What a marathon! DH earns a feather in his cap for his unending patience and perseverance today, and we have lots of wholesome goodness stored away for future use. Would I do it again? Probably, because I’m thinking it’s like childbirth and time makes you forget the pain. Joan – your DH is a better guy than mine. ha Glad you both had fun with your Pom de-seeding. My memory of poms was always getting a nickel to go buy one after school when they came to the local grocery store (you can tell I am old by the cost they were). We would peel them and eat the juicy seeds right from the shell. Such good childhood memories. I didn’t brave getting a case, but was certainly happy with the ones that came in the basket. What a fun way of letting us all know what you did with your case of poms. Sounds like you made a good choice in your DH! I miss the days when my mom and would seed a whole tree’s worth of fruit in an afternoon (or maybe two if was a really bumper year). It goes pretty fast, once you get going, and even faster with two! We would juice all of them, and make either syrup (goes great on fruit salads or pancakes! ), or jelly. Teri, we did not keep the seeds. Once they were run through the juicer, we put the seed remains outside for the wildlife. We only kept the juice. I didn’t get the cases of poms, but curious about the process. I understand how to de-seed them, but how does one juice them while still keeping the seeds? This is actually our first experience with fresh pomegranates. Thank you.